Thyagaraja's legacy is the glorious set of five compositions - the Pancharatnas. This album by Charulatha Mani is a treat to music lovers. 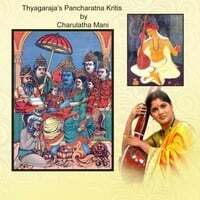 The Pancharatna kritis are the five magnificent compositions of the Saint Thyagaraja and are rendered impeccably here in this album, in the golden voice of Charulatha Mani. Nadaswaram, violin, and veena accompaniments add joy to this presentation while the mridangam and kanjira enliven the album.